Affordable Dentures & Implants has an experienced Sevierville, TN, dentist who focuses on tooth extractions and preparing dentures and partial dentures for patients. We also can repair dentures when they crack or break and reline and adjust dentures when they’re not fitting properly. As a practice that's individually owned and operated by a licensed dentist, we’re proud of our high standards of quality care and our commitment to client education. Our on-site dental lab allows us to keep our prices reasonable, and we make flexible financing options available to our patients. We offer same-day, emergency services to patients who need them. Our goal is to fit you with dentures that may be able to help you speak more clearly, eat more comfortably, and smile with greater confidence. 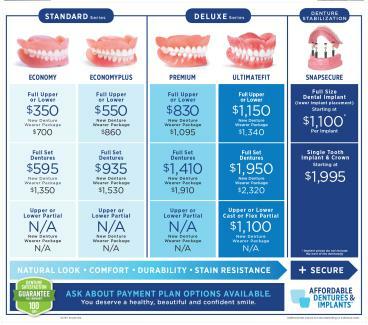 At Affordable Dentures & Implants, we take pride in offering you dentures that are customized to meet your needs. Once you’re fitted with your new dentures, we’ll also show you how to take care of them so that they will continue to serve you. We’re the Sevierville, TN, dentist that focuses on dentures, so call us today to set up an appointment.